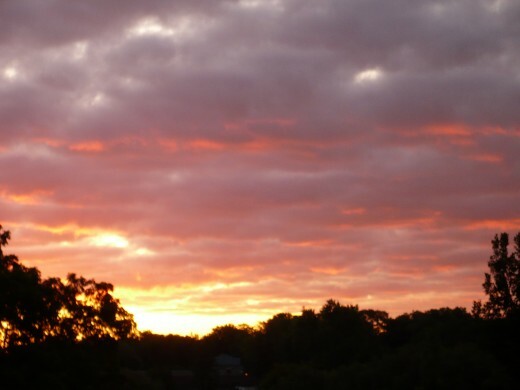 This gorgeous sunrise is how your day in the Festival city of Stratford will start.Stratford hosts four Theatres to engage in Shakespearean plays, and music concerts all within walking distance of each other and the Victoria architecture of the downtown core. 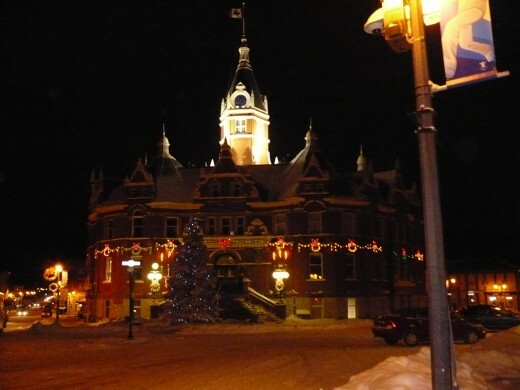 To the north of the Downtown core is a hundred year old Court house and a century year old library. Both of them still have the original oak wooden floors that still creak when you walk on them. Both of there facilities are in working order today,serving thousands of people from Perth County and tourists. 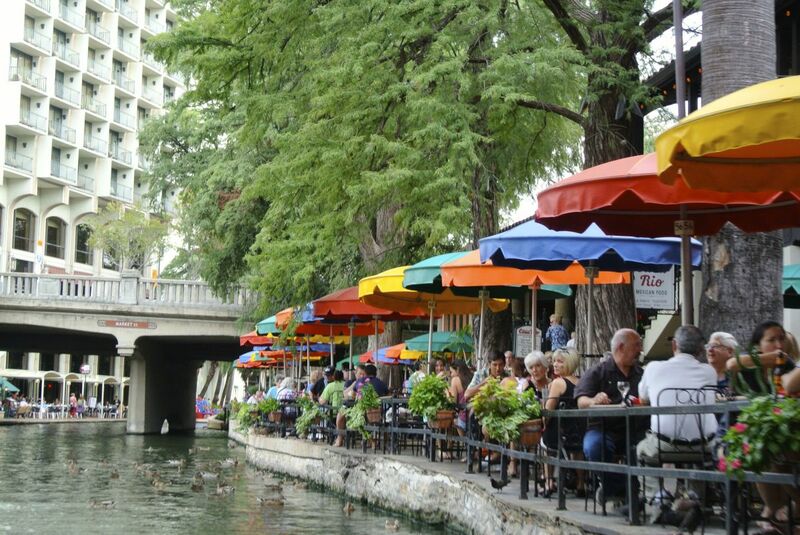 The tourists love our Stratford Restaurants featuring any cuisine you desire that day. A walk around the Avon River/ Victoria Lake viewing the many ducks and swans is another fun thing to do between shows. 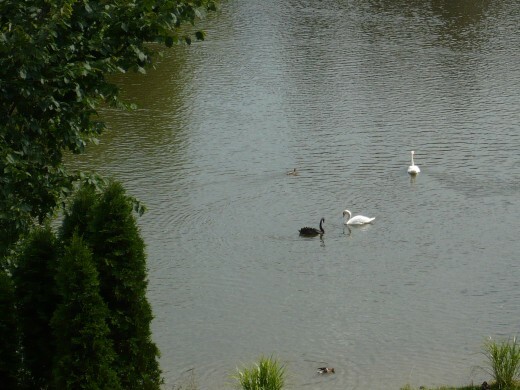 There is as much drama on the river between the cobs (male swans) who are very territorial of their mates and their territory. Swans mate for life. Be careful feeding them on your walks because they can become very nasty if you get too close. Aways feed swans grain pellets ,you can purchase them from the Boat-House or the Tourist (welcome centre) situated on the north end of Lake Victoria near the R.Thomas Orr Dam. The R.Tomas Orr Dam was part of Stratford's flood control project in 1965. 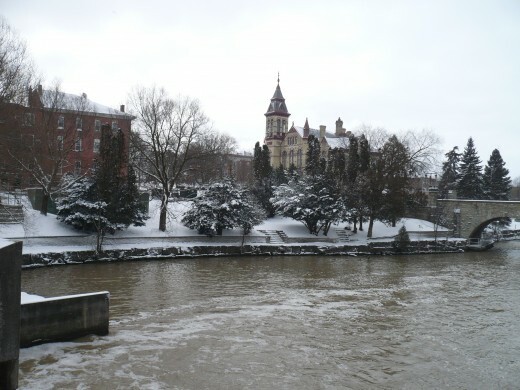 It is situated between the Avon River and Victoria Lake. 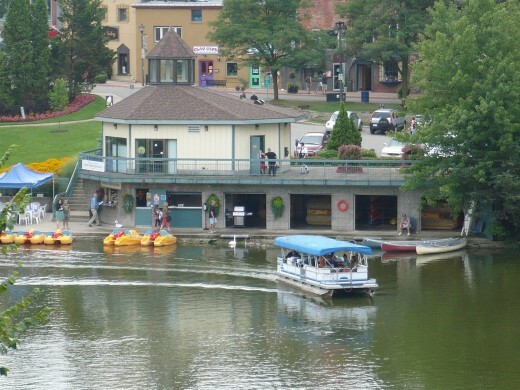 The Boat House is famous for a pontoon boat ride and lunch down the Avon River/Victoria Lake. From the boat you can look into the immaculate, manicured back yards of some of Stratford's Bed and Breakfast waterfront properties. The Boat house is on the south end of the R.Thomas Orr dam. When you cross the dam to the other side of the river, you come upon the Lions Swimming Pool (an outside swimming pool) and the new Pergola . The original Pergola was built in 1931 and was a lot bigger supporting six pedestals instead of four, that the new one has. This Pergola was swept away in a heavy rainfall that flooded the banks of Victoria Lake on April 25/1937. 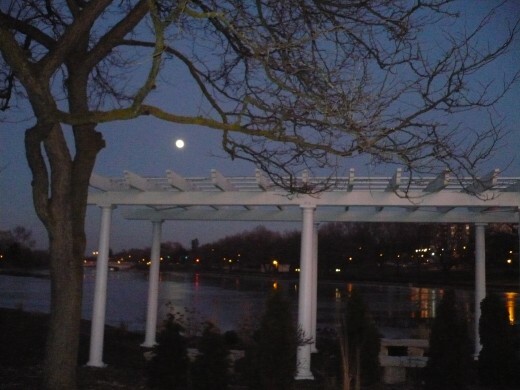 The construction of the New Pergola started in the spring of 2010 and was dedicated to Stratford on September 11 /2010. This Pergola is surrounded by gardens with large stone benches for tourist to relax on and enjoy the view of the lake. Turning to the right ,past the Pergola, you can continue on a walking path that sneaks down the water's edge to the east end of the Queens Park. 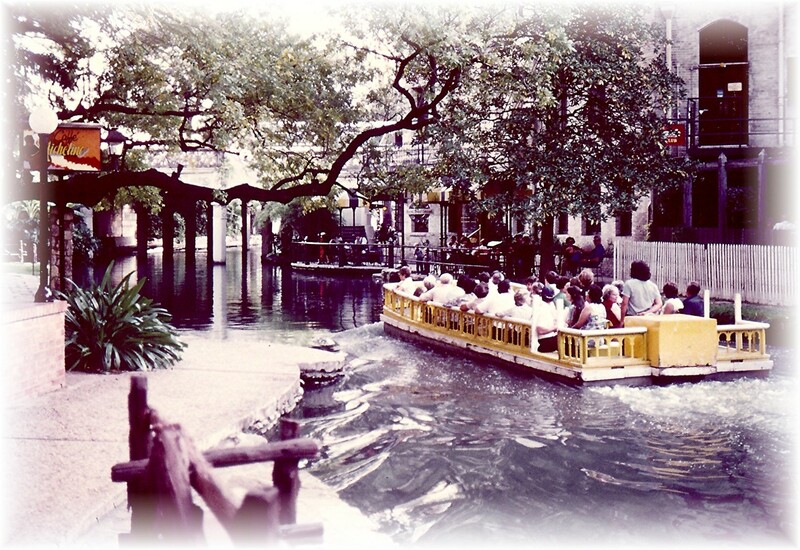 You will be walking over quaint wooden bridges and seeing large old Weeping Willow trees that enhance the rivers view. Coming to the end of this path you can cross the river to Snake Hill. So called because it hill snakes up to upper Queens Park and the Famous Stratford Shakespearean Festival, a great place for a picnic. Upper Queens Park opens up to the east end of Stratford, where you then turn east down Ontario Street to the shopping malls. 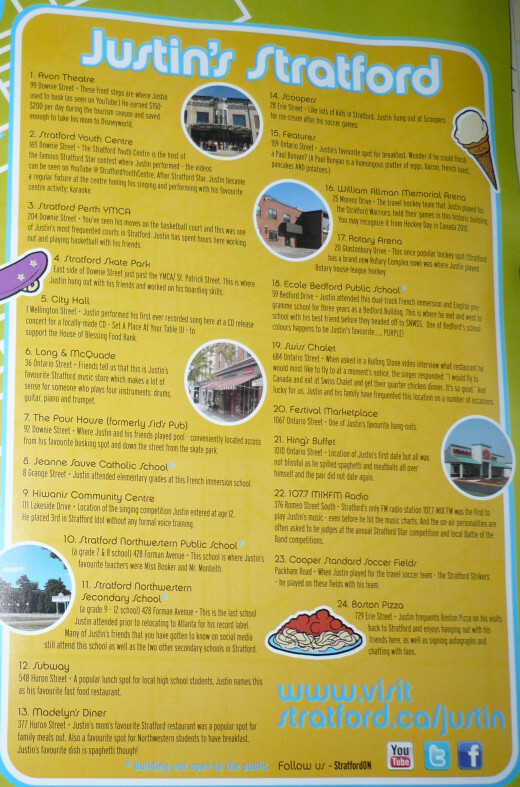 There is plenty of restaurants and stores but sorry no Walmart is in Stratford yet. 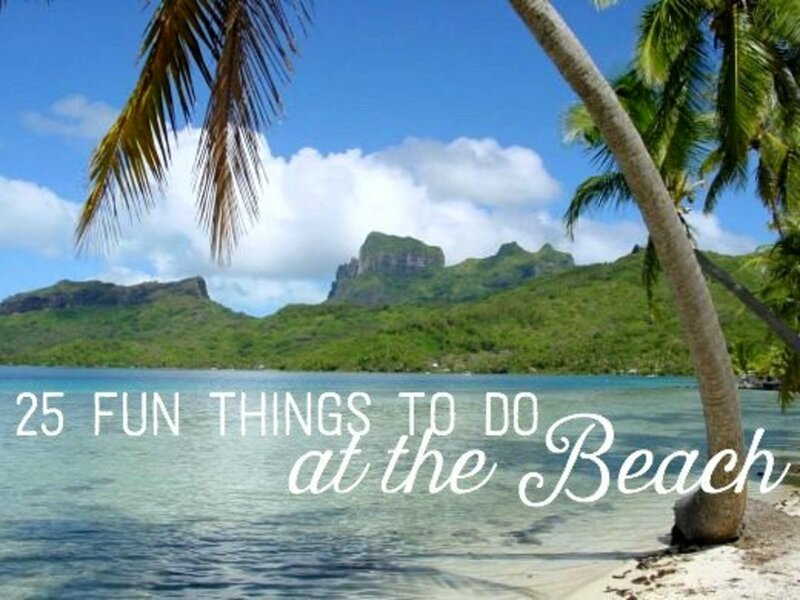 There is wining and dining galore,shopping and outside nature walking, picnics areas and all the wonderful Theatres,swimming pool,much more than I could do as a one day Tourist of my hometown. Stratford's Queens' Park is so inviting with all its' varieties of birds. The swan parade brings an enormous amount of excitement to this already bustling theatre city known as Stratford. What is the barter system. It is trading what you have or do for what you need. Community gardens can improve your health. Sharing your garden tips with others and benefit your community. Thank you Kathryn Stratford. Hundreds of girls have come to Stratford. I work at his favorite family Diner. Lots of girls come there to get his favorite milkshake strawberry banana and say they dined where Bieber dined. It is crazy. 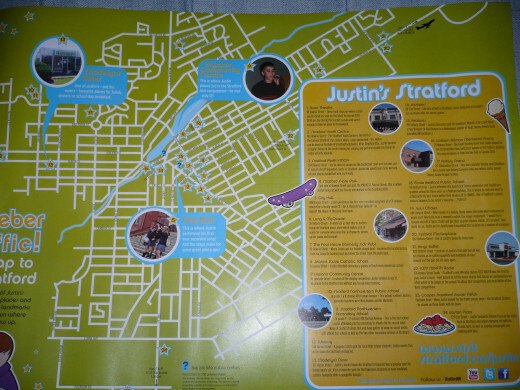 The Tourist Booth in Stratford hands out those Bieber maps for free. Your grandpa sounds fun. Thanks for the visit, the follow and have a good day. What a nice idea, to be a tourist in your own neighborhood. I remember that whenever I used to visit my Grandparents when I was a kid, my Grandpa would act as a tour guide in his hometown of Sterling, VA (near Washington D.C.), and it was interesting to see his home through his eyes, and hear all of the useful tidbits he knew about the place that a passerby wouldn't know. After your comment about your hometown of Stratford, I had to check this out! I didn't realize that's where Bieber was from. Cute. I wonder how many love-struck young girls have toured the area?! Thanks for sharing this lovely tour, with the photos and guide. I like it! I could get up for that!! I love this, looks wonderful and I know it is.